On December 7th, British mod pioneers The Who will be in Washington to receive a prestigious award for their contribution to the cultural life of America. 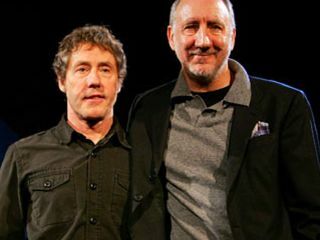 The honor - chosen by the Kennedy's Center's Board of Trustees - was awarded to The Who's Roger Daltrey and Pete Townshend for 'transforming the sights and sounds of rock and roll." The Kennedy Center Honors is an annual event which recognises a lifetime of involvement in the arts, whether in dance, music, theatre, opera, films or television. Although the event receives little attention in the Who's native Britain - well, we've never heard of it - the Honors actually mark the highlight of cultural life in the US, and were first established in 1978. Anyone who's anyone in the American art world will have been involved. Even George Bush. Nevertheless, The Who is the first band ever to be given this honour and Elton John became the only other British recipient when he received the award in 2004. Other honourees this year include Morgan Freeman, Barbara Streisand, dancer and choreographer Twyla Tharp and popular country music singer George Jones. Guitarist and songwriter Pete Townshend commented, "This is a great thrill. Since The Who began in the early '60s we have loved American music and audiences and have made deep and lasting friendships with everyone involved in the industry there. Roger and I both feel our work in the United States has been as important as our work at home. Because our medium, rock music, is quintessentially American music with broad and deep international and multicultural roots, this honour is especially meaningful to us Brits".